(Jeremy Harmon | Tribune file photo) Security personnel for The Church of Jesus Christ of Latter-day Saints informs demonstrators marching across Main Street Plaza in Salt Lake City they are trespassing, during a protest Sunday, July 12, 2009. Church officials have confirmed they have plans to build a new training center for personnel in its church security department, complete with shooting ranges and facilities for instruction on the use of force. The quiet south end of a massive warehouse in west Salt Lake City may one day ring with gunfire. The Church of Jesus Christ of Latter-day Saints plans to build a new training center for its in-house security forces in an otherwise unremarkable church storehouse, complete with two shooting ranges and facilities for teaching about defensive tactics and the use of force. Tentatively called the Church Security Department Training Center, the 67,600-square-foot facility would be remodeled from part of an existing bishops’ storehouse at 390 S. 5200 West in Salt Lake City, according to Feb. 8 architectural drawings leaked online and obtained by The Salt Lake Tribune. Church spokesman Eric Hawkins confirmed the new training center was under consideration but said that no final construction plans had been approved. 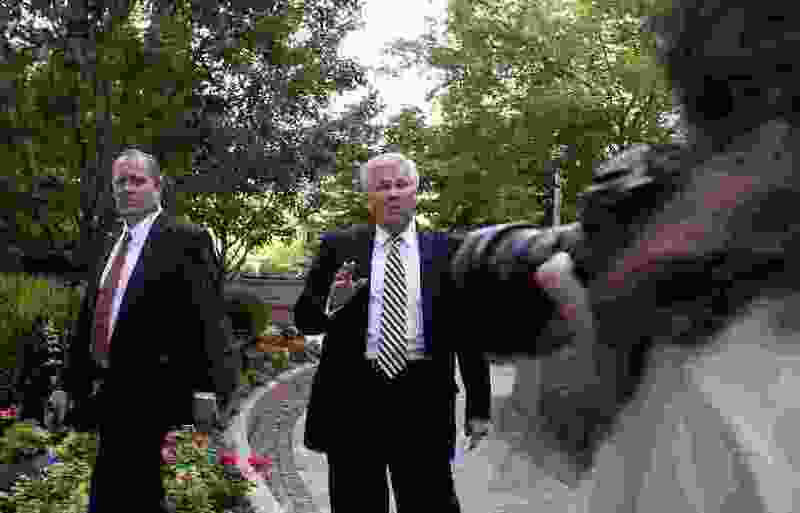 He said the longstanding mission of the Church Security Department — protecting church leaders, employees and the millions of worshippers visiting downtown Salt Lake City’s Temple Square and other church venues worldwide — “requires frequent training,” calling for specialized space and equipment. “Growing demand on these types of facilities by all security and law enforcement services has required that church security find or construct new space for their training,” Hawkins told The Tribune in a statement. He said the center did not reflect any proposed increases in security staffing levels for the global faith nor any shift in approach to existing training, deployment or use of firearms. Word of the planned facility comes just days before the faith convenes its semiannual General Conference, drawing tens of thousands to downtown Salt Lake City’s Conference Center amid increased security for sessions Saturday and Sunday. No timetable for construction of the church security training center is included in the 149-page computer-rendered blueprints, which were produced by FFKR Architects, a leading Salt Lake City firm that has also designed several temples and other church facilities. Plans show the center would be built into the south end of what the church calls its Bishops’ Central Storehouse First Park Building, a structure that property records say was constructed in 2009. The storehouse is located just east of Deseret Transportation, a trucking subsidiary that serves the church’s philanthropic operations, and south of an R.C. Willey Home Furnishings warehouse at 256 S. 5500 West. Blueprints indicate the training center would have at least two classrooms, along with several rooms and facilities dedicated to specialized security instruction. One large hall and at least 10 smaller adjoining rooms are labeled for use in “force on force training,” plans indicate. Another large room would be used for “defensive tactics and physical training.” One area would feature a “use of force simulator,” according to blueprints. Two shooting ranges — one 35 yards in length, the other 100 yards long, presumably for handguns and rifles, respectively — would occupy most of the new center’s north end, plans show. Designs call for 12 firing lanes on each range, along with ballistic ceilings, bullet traps and a complex system of suspended baffles to dampen noise. The training center would be coed, judging from designs for locker rooms and other areas for men and women. The rest of the 469,440-square-foot storehouse would remain in use, though separated from the training center by fortified walls and doors requiring keycard access, plans say. Links to the blueprints were posted March 15 in an online discussion board called LDS Freedom Forum by someone identified as a subcontractor on the project. The link was redacted a week later, the original poster wrote, after the project’s general contractor told subcontractors the church had requested confidentiality. FFKR and other Utah-based contractors involved in reviewing and certifying aspects of the plans declined to comment, citing privacy policies for their clients. Until being contacted last week by The Tribune, top city officials were unaware the new facility was being contemplated within city limits, including Mayor Jackie Biskupski, key members of her executive staff and the city’s top planner. “The city has no knowledge of this,” said Biskupski’s spokesman Matthew Rojas, who noted that no formal applications had been filed as yet at City Hall. Hawkins said the lack of information reflected the fact the church’s plans were still being considered. As proposed, the center would fall within the boundaries of the Utah Inland Port, carved out of Salt Lake City’s northwest quadrant by state lawmakers in 2018 as the future site of an advanced logistics and shipping hub. Under laws creating the trade zone, the Utah Inland Port Authority would have final say over approval of the church’s new training center after the city’s planning and zoning review process. The site is on one of several large swaths held by the church inside the inland port. Hawkins said officials chose the training center location because the church already owned the property in question and that the decision had no connection to the port. The Salt Lake City-based faith has a longstanding policy of not commenting on the operations of its security department, which is housed in the downtown Church Office Building. Hawkins said church security forces include about 200 trained professional officers worldwide, along with some volunteers, including missionaries who staff security check-in desks at events or for church buildings. The church spokesman said security forces trained at the new Salt Lake City facility would not be deployed overseas. Church security officers are generally drawn from the ranks of former law enforcement officials, several sources said. They reportedly add to their existing training with courses through the state Department of Public Safety’s Peace Officer Standards and Training program. Hawkins said all but a few of the church’s full-time security officers are trained in the use of firearms, though he added that such personnel would carry weapons only as their assignments require or allow. Those who do must undergo background and mental-fitness checks, he said. Church policy, meanwhile, advises worshippers not to carry firearms on church property. Under Utah law, the church has officially notified the state’s Bureau of Criminal Identification (BCI) of its intention to prohibit firearms in its houses of worship. The church also issued a public notice to that effect as recently as Jan. 9, according to BCI, with ads in Salt Lake City’s two largest daily newspapers. The church’s Global Security Operation Center reportedly also includes a dispatch center and some training facilities, according to San Francisco-based RLS, and connects to a “secondary crisis room” in the Church Office Building, where the offices of regional church security officers are also located. Job requirements also include “temple worthiness,” meaning compliance with church tenets as verified by an interview with local lay leaders.